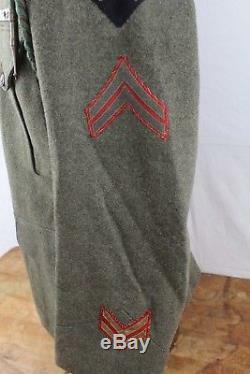 A named 3rd BN, 6th Marine Regiment uniform for a Earnst Franklin Hess who was wounded at Belleau Wood. 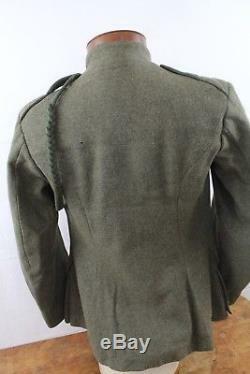 Research showed that he was wounded in Belleau Wood when he was serving at on outpost on 23 June 1918 and was wounded in the thigh, both arms, and left eye. 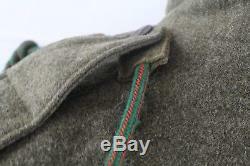 Furthermore, he served in the trenches in the Verdun sector and saw heavy action. 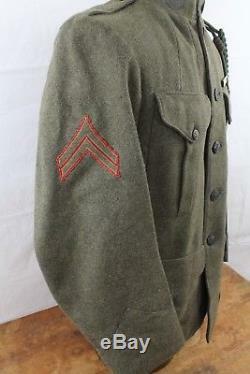 The previous collector attached CPL Hess' dog tag to the uniform. 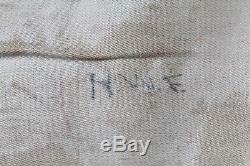 In one of the coats sleeves, but I cannot identify who those initials belong to. 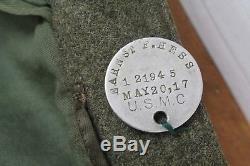 Additionally, research showed the name Ernest instead of Earnst, as stamped on his dog tag. 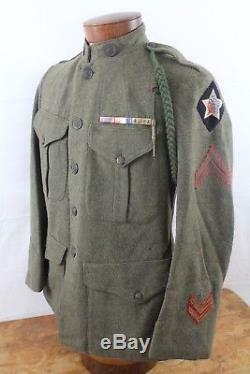 Finally, I cannot say why he did not sew the wound chevrons onto his uniform. 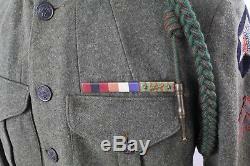 Included on this is his French Croix de Guerre fourragere cord with the ribbon that has one gold palm leaf and two stars and a good conduct. There are some scattered moth nips. Be sure to check us out at MenWithHills online. 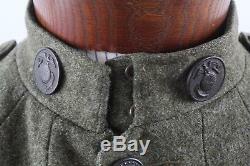 All items are guaranteed authentic except for where noted. All props used in photographs are not included in the sale; this includes but is not limited to, stands, backdrops, etc. Feedback will be left to successful buyers. We strive to make sure you are satisfied with your item. 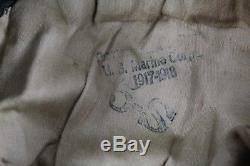 The item "WWI USMC 3rd BN, 6th Marine Regiment Belleau Wood Wounded Veteran" is in sale since Thursday, January 04, 2018. 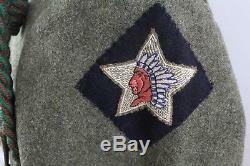 This item is in the category "Collectibles\Militaria\WW I (1914-18)\Original Period Items\United States\Uniforms". 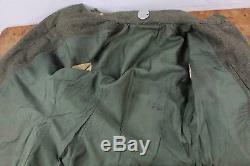 The seller is "menwithhills" and is located in North Augusta, South Carolina. This item can be shipped to United States, Canada, United Kingdom, Denmark, Romania, Slovakia, Bulgaria, Czech republic, Finland, Hungary, Latvia, Lithuania, Malta, Estonia, Australia, Greece, Portugal, Cyprus, Slovenia, Japan, China, Sweden, South Korea, Indonesia, Taiwan, Thailand, Belgium, France, Hong Kong, Ireland, Netherlands, Poland, Spain, Italy, Germany, Austria, Israel, Mexico, New Zealand, Singapore, Switzerland, Norway, Saudi arabia, Ukraine, United arab emirates, Qatar, Kuwait, Bahrain, Croatia, Malaysia, Barbados, Bangladesh, Bermuda, Brunei darussalam, Bolivia, Ecuador, Egypt, French guiana, Guernsey, Gibraltar, Guadeloupe, Iceland, Jersey, Jordan, Cambodia, Cayman islands, Liechtenstein, Sri lanka, Luxembourg, Monaco, Macao, Martinique, Maldives, Nicaragua, Oman, Pakistan, Paraguay, Reunion.